Toxic and tax exempt: How tar sands spills from Michigan to Arkansas cost us all. As the Obama Administration continues to ponder a decision on the Keystone XL pipeline, TransCanada has been assuring everyone of it’s safety. “Safety of the public and the environment is a top priority for TransCanada” their slick website reads. Any spill is deemed “unlikely”. Hardly. Last year, there were 364 spills from pipelines that released about 54,000 barrels of oil and refined products. In 2010 in Marshall, Michigan an Enbridge pipeline sent 819,000 gallons of toxic tar sands crude into the town’s creek just 80 river miles from Lake Michigan. 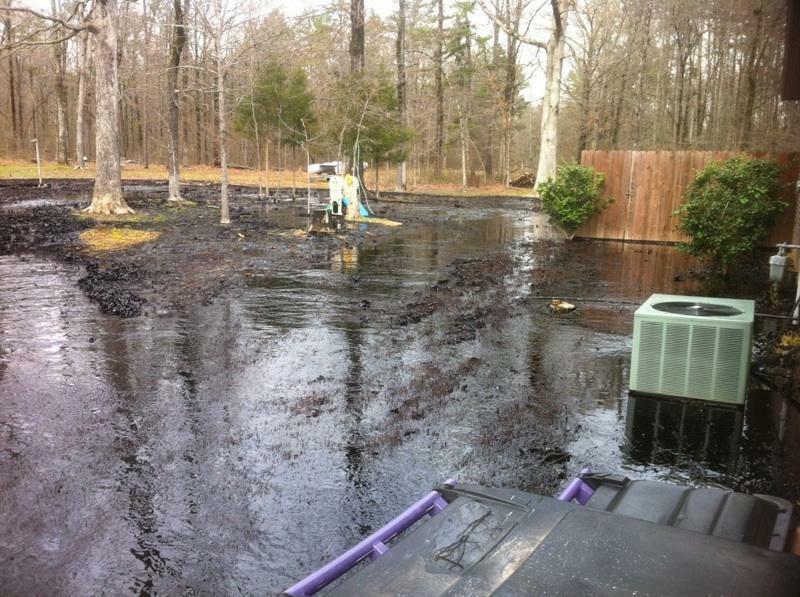 Now in Mayflower, Arkansas, 22 homes have been evacuated this week as Exxon prepares to attempt to clean 10,000 barrels of this same dirty tar sands crude from neighborhoods. The experiences of people of Marshall, Michigan may shed light on what the citizens of Mayflower, Arkansas may now be in for. On July 26th 2010, at 7:30 a.m., Marshall resident Susan Connolly dropped off her children at daycare. That Michigan morning there was a strong smell in the air, making it hard to breathe. By the time she picked up her children just a few hours later, the symptoms had started. That night her son vomited. The week following, her daughter had a rash, as did almost all the children at the daycare. The other children also reported cases of vomiting, upset stomach, shortness of breath, lethargy, headaches, rash, irritation with the eyes, sore throat, and cough. Meanwhile, Connolly and her husband experienced migraines, eye irritation, sore throat, nausea, and cough. Just six days later, their dog came in from the yard suffering from continuous vomiting and diarrhea. They quickly learned that this was all related to a broken Enbridge pipe, spilling bitumen ooze into the water just 6/10ths of a mile from their children’s day care and just two miles from their home. Bitumen is a thick, sticky, black semi-solid form of petroleum. It is transported from Alberta Canada as diluted bitumen (dilbit) on its way to refineries in the U.S.
Their concern is understandable. The EPA established that there were 15 parts per billion of benzene in the atmosphere in the region of the spill, which is roughly three times the standard established as safe for human exposure. Connolly’s story highlights the clear effects of the revolving door of money from politicians and fossil fuel companies keeping the safety standards and oversight low. In 2009 and 2010 fossil fuel companies like Enbridge spent $25.8 million lobbying Congress and in return they received subsidies and tax loopholes worth $20.5 billion. That’s a 5800% return on political investment; about $59 in return for each dollar they spend lobbying. Companies that transport oil are required to pay into the Oil Spill Liability Trust Fund, giving the government a pot of money for immediate spill responses. The Enbridge pipeline in Michigan and the Exxon pipeline in Arkansas, however, are exempt because these pipelines are not considered to be carrying “conventional oil”, despite the fact bitumen spills are more expensive and more dangerous. In a January 2011 memorandum, the IRS determined that to generate revenues for the oil spill trust fund, Congress only intended to tax conventional crude, and not tar sands or other unconventional oils. This exemption remains to this day, even though the United States moves billions of gallons of tar sands crude through its pipeline system every year. The trust fund is liable for tar sands oil spill cleanups without collecting any revenue from tar sands transport. If the fund goes broke,the American taxpayer foots the cleanup bill. ok, let’s get the foxes out of the position of writing epa and state department reports about the henhouse. Real science, and while we are at it, no tax exemptions or cost of cleanup exemptions, Exxon still hasn’t fully paid for the Valdez… Come on. Who will pay for the spills and what loopholes will be granted to keep the company from paying.